The reigning NFC champion Seattle Seahawks (6-5) are traveling to Minnesota for a matchup with the Vikings (8-3) at TCF Bank Stadium. Both teams have found their groove in the middle of the season, but Seattle hasn't been the same dominating force. Daniel House previews the game and provides his five keys to a Vikings victory. The reigning NFC champion Seattle Seahawks (6-5) are traveling to Minnesota for a matchup with the Vikings (8-3) at TCF Bank Stadium. Both teams have found their groove in the middle of the season, but Seattle hasn't been the same dominating force. If the playoffs were today, the Vikings would be playing Seattle in the first round. This matchup with the Seahawks could be a preview for a much more significant game in the future. Seattle will be without both Jimmy Graham (season-ending patella injury) and Marshawn Lynch (sports hernia). They both are critical aspects to their offense, but the replacements the Seahawks have to offer aren't anything to slouch about. Minnesota will need to play a great game to knock off Seattle. That starts by establishing the run with Adrian Peterson and preventing Russell Wilson from extending plays. Russell Wilson is dangerous when he has time to extend plays. He's one of the best quarterbacks in the league at alluding pressure. The Vikings defense has notoriously had problems with quarterbacks that can extend plays. Keeping Wilson in the pocket will be one of the main ways the Vikings can slow the Seattle offense. Wilson is best at escaping and finding receivers at they break off their routes or come back for the ball. With Doug Baldwin being a clear vertical threat, Xavier Rhodes will need to keep tabs. However, it will be hard if the secondary has to cover him longer when Wilson gets extra time. Not to mention, Wilson has the potential to pick up critical first downs on third-and-long with his legs. The Vikings defense will be busy keeping him in line on Sunday. Marshawn Lynch is out, but that doesn't mean Thomas Rawls shouldn't be monitored. He has 685 yards and three touchdowns since he's filled in for Lynch. He is a powerful, but quick back that makes people miss. If the Seahawks run the ball for yardage, they'll set up their passing game and that can't happen. Rawls rushed for 209 yards a few weeks ago and must be contained and tackled well. If the Vikings can limit rushing yardage and contain Wilson, they'll have a great chance to slow the scoring of an offense that has averaged 30 points per game over the last three contests. 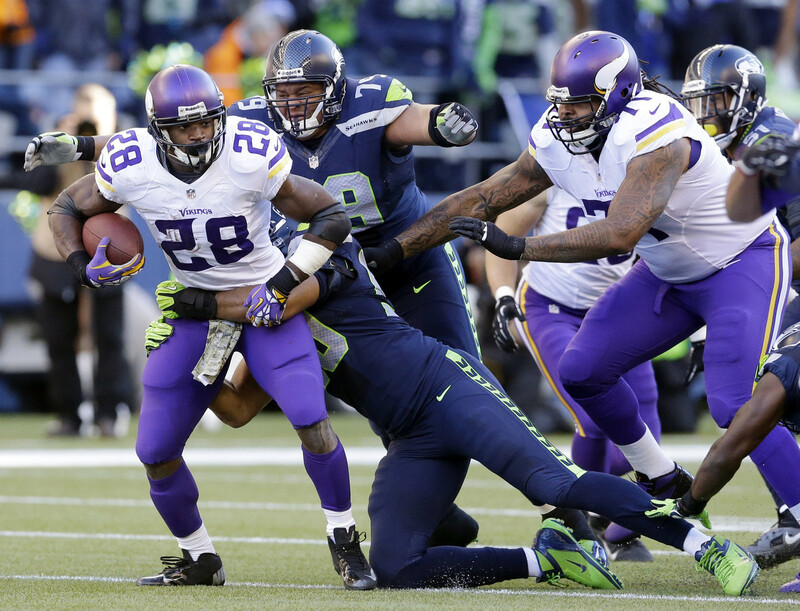 The Vikings can't let Michael Bennett and Cliff Avril control the line of scrimmage. Minnesota doesn't win when they can't keep Teddy Bridgewater protected. Seattle has tallied the seventh-most sacks and their front has been performing better as the season progresses. Help is needed on T.J. Clemmings side and it will be important again in this game. Running the ball well is going to be the biggest key for the Vikings offense. If they are forced to pass, they'll have a difficult time moving it through the air. It's not as much that Richard Sherman and Kam Chancellor have been lock down, but the Vikings wide receivers haven't been able to get open. In fact, the Seattle defense allowed 476 yards of passing to Ben Roethlisberger last week. However, moving the ball on the ground can provide more opportunities for the Vikings to get going through the air. Missing Harrison Smith was difficult last week, but I think it might be tougher to be without Linval Joseph in this game. Joseph has been tearing up the line of scrimmage as he's becoming an integral aspect of the Vikings interior. Anytime you lose a Pro-Bowl caliber player up front, it's a big deal. Sharrif Floyd will be playing nose tackle, while Tom Johnson makes his fifth start of the season. Floyd is just 297 pounds and will need to hold his weight as he is holding down the fort in the interior. Tom Johnson has continually performed well, but they'll need him to step up in a big way. Russell Wilson is elusive and the defensive line will need to bring him down immediately. He has been most lethal outside the pocket and can make difficult throws on the run. Wrapping him when you have the chance is the most critical way to defend him from being successful. Not to mention, Thomas Rawls is a good runner and if he has the chance to perform well, Seattle can control time of possession and pick up first down yardage. That is something that can be prevented, but it's definitely more worrisome without Linval Joseph in the middle. The Seahawks offensive line has been performing better over the last few weeks, but still have allowed the second-most sacks (37). Their offensive line has been re-tooled on a consistent basis, but according to Seahawks writers, moving Patrick Lewis to center over Drew Nowak has significantly improved their pass protection. However, running disguises up front and bringing linebacker pressure has still caused headaches for the Seahawks. Mike Zimmer has to be salivating over the thought of dialing up some unique pressure packages. I think the Vikings have the chance to dominate the line of scrimmage against Seattle. I'm not so certain the Seahawks offensive line can handle the pressure that will be thrown their way by this defense.